A 99-year-old woman has died after a head-on crash between a car and a minibus at Loch Lomond. 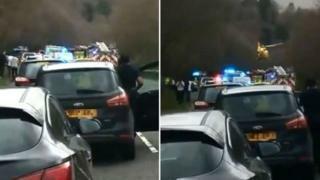 Police said she was a passenger in a black Vauxhall Astra which was in collision with a black Mercedes Vito, near Luss. A 73-year-old woman, who was driving the car, is in a serious condition in the Royal Alexandra Hospital, Paisley. The minibus driver and five passengers suffered minor injuries. The accident happened at about 14:50 on Friday. All six were treated at the scene of the collision, which caused long tailbacks on the A82 between Luss and Aldochlay.